They say that money does not buy happiness. That statement is completely false. If nothing else, money can buy security, and with security, there is a distinct amount of freedom. The freedom to do what one wants, when they want to do it. We certainly see this in the entertainment industry and it's obvious which stars' success has allowed them to pick and choose which projects they go after. Take Adam Sandler for example. After years of making actually funny films, he now seems content to just shoot home movies and release them into theaters. (Yes, Grown Ups, I'm looking at you.) But, this also allows him the freedom to do something different every once in a while, and that's why we have The Cobbler. Sandler stars in The Cobbler as Max Simkin, a sad sack of a man who has inherited his father's shoe repair shop in Brooklyn. Max goes through the motion of re-soling shoes during the day and tending to his mother, who has either Alzheimers or dementia, at night. Max will exchange pleasantries with Jimmy (Steve Buscemi), the barber who has the business next door, but he otherwise keeps to himself. One day, Max's stitching machine breaks. Desperate to finish a rush job, he goes to the shop's basement, where he finds an ancient pedal-powered machine. He finish the shoes and when he tries them on just for fun, he finds that he actually becomes the shoe's owner. Fascinated by this, Max tries on many different shoes in the store, marveling at the fact that he can "become" a number of different people. At first, he uses this for his own amusement and to fulfill some fantasies. But, his games soon get him involved with the wrong people. 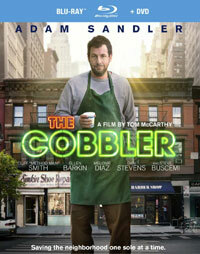 The Cobbler comes from actor turned director Thomas McCarthy, who also brought us 2011's quirky Win Win. That film succeeded because it took what was on the surface a very average story and made it into something special. The Cobbler does the exact opposite, as it takes a decidedly fairy tale-like idea and then goes to all of the most obvious and unoriginal places. Before we go any further, let's talk about the bizarre racial messages in this film. When Max first discovers the ability to look like other people, he commits two crimes. One involves ordering an expensive meal and then not paying for it, and the other is simply a robbery. He does both of these things while he looks like two different African-American men. How did no one catch this? What kind of outdate message is this movie sending when it portrays black men as criminals? And why does Max use these guises to pull off these jobs? We know that he can look like any number of people. Given the amount of stories in the news recently involving race, those behind The Cobbler may be glad that the movie has flown beneath the radar of most people. OK, that aside, The Cobbler has no idea what it wants to be. McCarthy and his writing partner Paul Sado have crammed so many ideas into the movie, that it almost plays like a group of short stories shoved together. Again, when we first meet Max, he's a hollow, lonely person. Then, he discovers the whole magic shoe thing and begins to live a little. But, this gets creepy, as he commits crimes and attempts to satisfy some jealous tendencies. Then, half-way through the movie, The Cobbler suddenly becomes a rip-off of Darkman, as Max uses his ability to look like various people to fight crime. Yes, you read that right. Max inadvertently comes across a scheme to push out long-time tenants in order to build new high-rises, and he comes to the rescue. The movie then concludes with a twist ending which doesn't work, as it's essentially a slap to the face for both the viewer and Max. It's like Glenda telling Dorothy at the end of The Wizard of Oz that she could have gone home all along. The movie begins as a Jewish folk tale and sort of ends that way, but the middle is crammed full of ideas which don't gel. As for Sandler, I can see why he would be attracted to the role, as it's a departure from his recent, shallow work. However, he doesn't bring much to the role. The point should be that the down-and-out Max perks up once he takes advantage of the magic shoes, but he doesn't. I may be wrong, but I can only imagine that the producers assumed that Sandler would bring some energy to the role, but Max remains pretty flat throughout most of the film. This also means that Sandler isn't funny here. Yes, this film has a more serious slant than most of Sandler's work, but not so much that he couldn't have thrown in some jokes to balance things out. I feel certain that The Cobbler looked good on paper, but the final result is very disappointing on many fronts. I was a huge fan of Sandler's first few films, and while I don't necessarily want to see him doing dramas, having him try something different sounded like a good thing, but he doesn't bring much to the role. Similarly, having enjoyed Win Win, I expected more from McCarthy, who comes across as tone-deaf here. They worst part may be that the movie isn't nearly as smart as it thinks it is, as its use of "soles" and "souls" is very heavy-handed and its take on "You can't know a man until you walk in his shoes" is almost too much to stomach. Try some peach cobbler instead. The Cobbler shows that 10 1/2 is a popular shoe size on Blu-ray Disc courtesy of Image Entertainment. The film has been letterboxed at 1.85:1 and the Disc contains an AVC 1080p HD transfer which runs at an average of 20 Mbps. The image is sharp and clear, showing no overt grain and no defects from the source materials. The colors look good and the image is never overly dark or bright. The level of detail is notably good and the picture has a very nice depth to it. The Disc carries a DTS-HD Master Audio 5.1 track which runs at 48 kHz and an average of 3.0 Mbps. The track provides clear dialogue and sound effects. The scenes taking place on the sidewalk provide obvious stereo effects as the cars go from side-to-side in the front channels. We get some mild surround effects during a nightclub scene. The musical cues also fill the rear speakers. The Cobbler Blu-ray Disc contains only two extras, one of which is a TRAILER. The other is "The Making of The Cobbler" (15 minutes), which is a fairly standard making-of featurette. It offers interviews with McCarthy and the primary cast, who talk about their characters. We then hear from Co-Writer Paul Sado who talks about the development of the script. There is some talk from the other actors of how they portrayed their version of Sandler's character. And, of course, we have to hear about what it was like to shoot in New York.